Cartier are to end their sponsorship of the CWA Cartier Diamond Dagger after twenty-six years, the Crime Writers’ Association announced today. 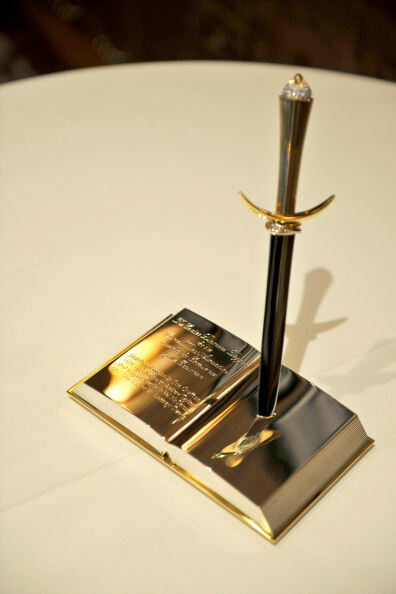 The Diamond Dagger, awarded for sustained excellence in crime writing, was presented to bestselling historical author Lindsey Davis during a champagne reception at the Savoy hotel. Davis is the creator of the well-loved ancient Roman private eye Marcus Didius Falco, and widely recognised as the godmother of the historical crime genre. At the same ceremony, Arnaud Bamberger of Cartier UK announced that this would be the final presentation of the award that Cartier would sponsor. The decision marks the conclusion of one of the most longstanding literary prize sponsorships, and coincides with M Bamberger ending his 18-year tenure as Managing Director of Cartier UK. He remains with the company as Executive Chairman. The award, a silver book with a diamond-encrusted Dagger plunged into the pages, has long been recognised as the highest accolade a crime writer can earn. Past winners include PD James, Ruth Rendell, John le Carré and Ian Rankin. For photographs or more information, please contact John Dean at media.enquiries@thecwa.co.uk. Craig - Thanks for this update. Sad that this sponsorship is ending, but it's easy to see why Davis won the award this year. Bummer about the sponsorship ending. She has a great sense of humour.